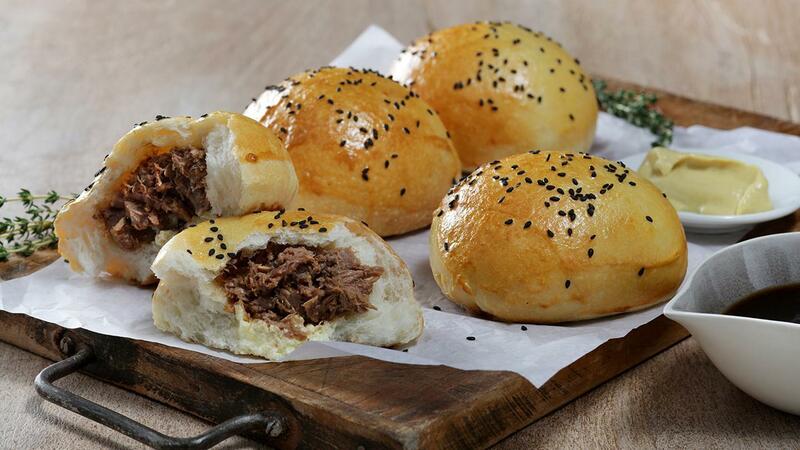 In this recipe, the pulled Beef is baked inside the bread bun, letting your guests tear open the buns with anticipation. Served with Knorr BBQ Sauce to dunk the buns into, Mustard rounds of the condiments. A great dish for Ramadan. Score theinside of the beef brisket with a sharp knife and rub with Knorr Coating Mix Marinade and sugar. Marinate for 1 hour then prepare the Knorr Demi Glace with 2L water for 80g powder. Preheat the oven to 160°C. Place the beef brisket in an oven dish and pour the prepared Knorr Demi Glace over the beef. Add rosemary and bay leaves. Cover the whole tray with aluminum foil to prevent any moisture escaping. Place in the oven to cook slowly for 40 min. After 40 minutes, the beef should be soft and tender. Pull the braised beef into shreds with a fork, mix in the mustard and keep to use as stuffing for the buns. In a small bowl, mix milk with water. Add sugar, yeast, and butter. Stir until yeast is dissolved and set aside for 10 minutes or until yeast has foamed up a bit. In a large bowl, mix flour and Knorr Chicken Stock Powder. Use the lower amount of flour to start with and add more only if the dough is really too sticky. Place in greased bowl, cover tightly with plastic wrap, and let rise in a warm place for 15 minutes. Roll out the dough into 10cm rounds and place approx. 30g of meat filling inside, close up the roll thigh. Allow the dough to rise for 10min. Bake at 180°C for about 12 minutes or until golden brown. Serve buns with additional Knorr Barbeque Sauce and Mustard on the side.